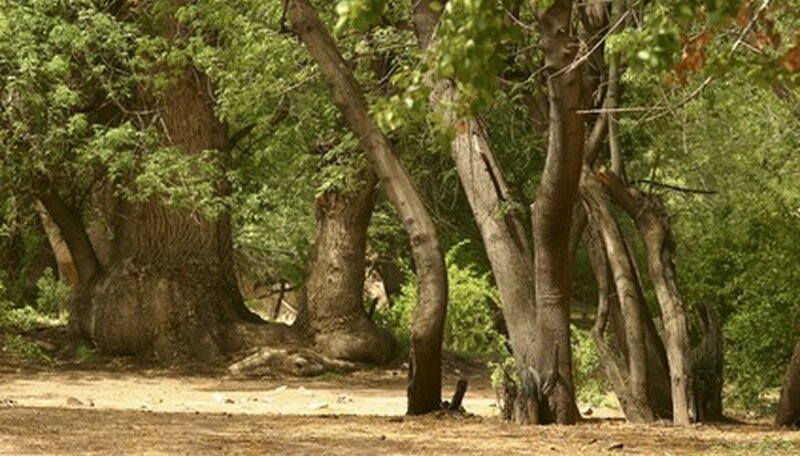 Shamel ash is a medium-size tree, between 50 and 65 feet tall, predominantly grown in hot arid regions. It is also known as the Mexican ash. The tree has been classified as invasive due to the suckers that come up around the tree, the ease in which it germinates, and the huge amount of nutrition it takes out of the soil. The trees actually belong to the olive family and the leaves are similar to the classic olive pinnate form. Shamel ash are either male or female trees. The male is known to release a large amount of pollen while the female releases none. The flowers are nondescript on both trees, however female trees produce more flowers and therefore more fruit. The fruit is in the winged "samaras" shape and is easily caught by the wind to seed anywhere. The tree is not native to North America, but has become a popular tree in the southwest. Shamel ash trees can grow up to 36 inches in a year and they are blamed for reducing the fertility of their planting sites. The Shamel ash tree is not bothered by many pests or disease issues, although it is very susceptible to anthracnose, a fungal disease that results in yellow leaves and brown blotches. Scale and aphids are minor pests, but they will not kill the tree. It is immune to oak root fungus, but the Shamel ash does have problems with Texas root rot or "cotton fungus." And the tree itself is considered toxic due to its high pollen count. Texas root rot fungus is soilborne and may live in the earth for years. The mycelium invade the roots of the tree and cover epidermal cells. In warm moist environments, the mycelium will form a mat of whitish fluffy fungus on the surface of the roots. It can kill a young tree fairly quickly, but symptoms in a mature Shamel ash tree start out as thinning in the crown, some dieback and poor vigor. Increasing the soil acidity will help control the spores. A strange fungus called H. albidus was discovered on ash trees in Switzerland in 2008. It creates small white fruiting bodies on the limbs and branches of ash trees, causing severe dieback and killing some of the trees. H. albidus was known to be a harmless leaf decomposer that was first found in 1851. Tests showed that the recent discovery was actually a different species and renamed it Hymanoscyphus pseudoalbidus. Powdery mildew is a fungus that sits on the leaves of ash and other trees. It is white and looks a bit like the leaves were dusted with talcum powder. It can cause defoliation and death of infested tissue. Keeping the tree openly pruned will help reinfection as it increases air circulation and reduces moisture on the leaves. There are combative fungus sprays that are a biological control, but the most common method is chemical control. A regular spray program of fungicide or copper spray will keep powdery mildew from reappearing.